Stay at the Conveniently Located Augusta West HotelSituated just off I-20 at exit 194, our Augusta hotel provides easy access to Augusta National Golf Course and Fort Gordon. Whether you're in town to relax or for business, our ideal location puts you in the center of all this great city has to offer.Business travelers enjoy our outstanding amenities, such as a complimentary full breakfast buffet, a 24-hour business center, free high-speed Internet access, copy and print services and a personal computer, as well as 1,855 square feet of versatile meeting space. In addition, we offer close proximity to John Deere, EZ Go, Serta Mattress, Georgia Iron Works, Club Car and other companies.For guests that just want to relax and enjoy area attractions, our hotel's location in Augusta, GA provides easy access to many wonderful leisure options, including sightseeing at the Augusta Riverwalk and catching a concert at the Augusta Amphitheater. You can also enjoy shopping at the Augusta Mall or catching a Greenjackets game. When you're looking for hotels in Augusta, GA, consider staying at our property, which features choice amenities like a complimentary full breakfast buffet, an indoor heated swimming pool and an on-site fitness center. Kem's, our full-service restaurant, serves delicious American cuisine, and Kids Eat Free. 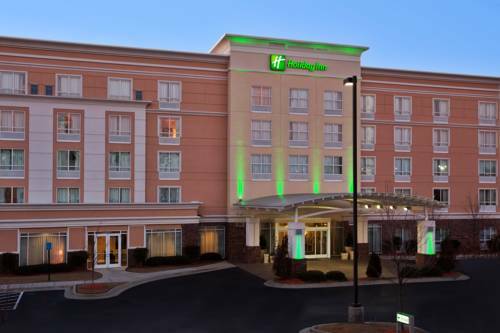 Call today to enjoy all the perks the Holiday Inn Augusta West I-20 Hotel provides! Kem's: If you're searching for hotels in Augusta, Georgia with delicious food, look no further. Our full service restaurant, Kem's, offers a variety of freshly prepared American dishes, as well as a relaxing, family atmosphere, which is perfect for any occasion. Kem's: When you stay at our hotel's location in Augusta, Georgia, stop by Kem's Lounge, which offers an intimate environment, ideal for gathering with friends or meeting a colleague. The drink menu features premium liquors, wines and bottled and draft beer. The Links: 1525 sq. ft. of flexible meeting space. Patriots ParkVarious leisure activities: 18 hole Disc Golf course, 9 tennis courts, a playground picnic area and 4soccer fields; gymnasium with 2 basketball courts or 4 volleyball courts, exercise room, 4 racquetball courts, multi-purpose room, and game room. Fort GordonA U. S.Army Installation and the current home of the United States Army Signal Corps and Signal Center. The main component of the post is the Advanced Individual Training for Signal Corps military occupational specialites. Augusta RiverwalkThe Augusta Riverwalk is one of Augusta's finest attractions located directly on the beautiful Savannah River. Take a stroll down the shaded sidewalks of the riverwalk that line the Savannah River and enjoy what downtown Augusta has to offer.